The Wakem family were long term residents of St Just in Roseland. In the late 1700s, one of their number, a John Wakem, found his way to the banks of the River Thames, to the east of the City of London. He married at St George in the East in 1796 and had three children, across the river in Rotherhithe, over the next ten years. The eldest child, Susannah, was less than two years old when she died in January 1800 and from her burial record we learn that her father was a mariner. 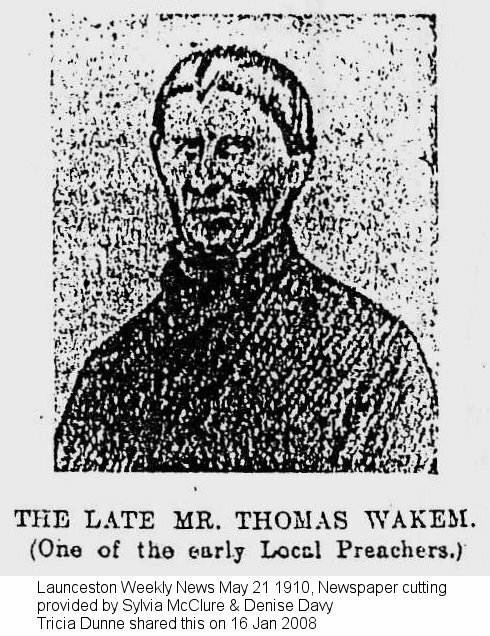 They had a son, John Robert, in 1801 and their youngest child, born in 1803, was named Thomas Dickens Wakem. John returned, with his wife and two sons, to St Just in Roseland where John died in 1817. Thomas Dickens Wakem married Elizabeth Gay in 1831 in St Just in Roseland. They had three children (Mary, Martha who died infancy, and Elizabeth) before moving to North Hill around 1836, initially settling in Langford Cottage on the Trebartha Estate. Thomas was initially a farm labourer but by 1861 he had moved to Trebartha Lodge as the lodge keeper. The next census records the familyt living at nearby Plusha and Thomas was a lay Methodist preacher when not working on the estate. Whilst in North Hill another six children were born to Thomas and Elizabeth, including another Martha and a Susannah. Susannah Wakem married 28 year old John Brown, of Eltham in Kent, in Lewannick in 1869 and they went to live in Portsmouth; John Brown, was a ship's corporal in the Royal Navy and was stationed there. Their only child, John Thomas Brown was born in December 1870 and Susannah died as a result of the childbirth. So that John Brown could continue with his naval duties, baby John Thomas Brown was sent to be brought up by Susannah's parents, Thomas and Elizabeth Wakem, who lived at Plusha, Lewannick. Five years later John Brown married Martha, the elder sister of his late wife, Susannah. 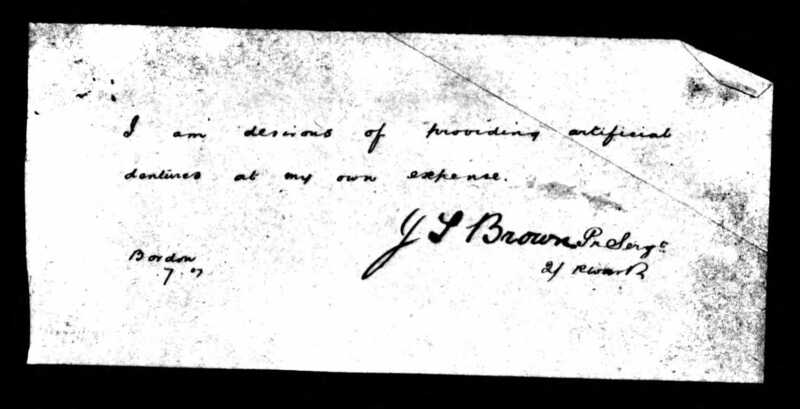 When John Thomas Brown arrived at Plusha there was another grandchild was already living with the family, eight year old Jane West. Jane's mother was Elizabeth Wakem, another of the sisters; no marriage has been found for Elizabeth and it seems likely that Jane's father married another woman in 1871. Over forty years passed after their first meeting as infant and child before Jane married John Thomas Brown to become Jane Brown in 1913. After his naval career, John Brown settled in Plusha and was an active member of the Methodist Church. His name is recorded in the book Truly Rural on page 67. Mary, the eldest daughter had four illegitimate children, one of whom was father to Harry Buckingham Wakem. 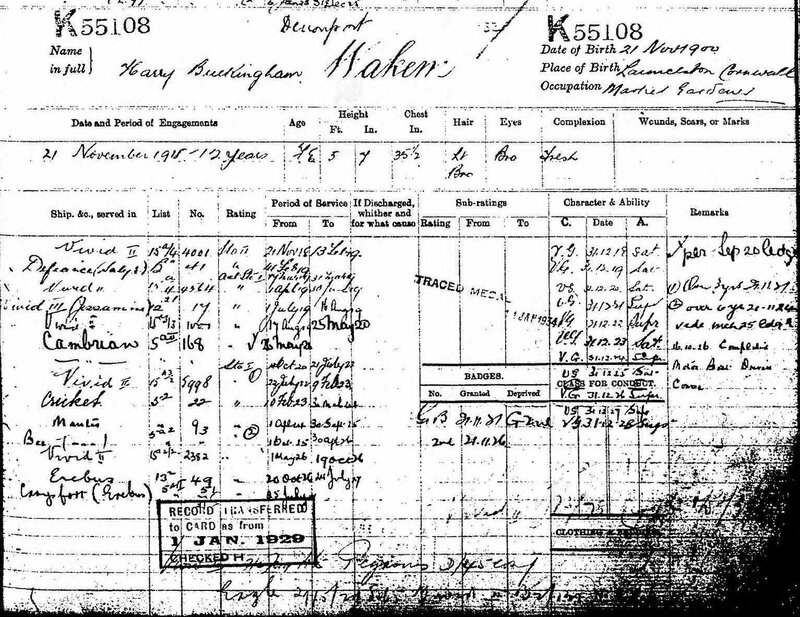 Harry Buckingham Wakem died on 13th April 1940 and was buried in St Torney's churchyard.His gravestone is still there. It is not a Commonwealth War Graves Commission monument but a private stone. Harry was recorded as one of the fallen of World War Two on the war memorial at Congdon's Shop. Can you help explain whether this was usual given that his service appears to have been completed a decade before the second war broke out? Click on this image to see his service record. Did he return to service at the outbreak of hostilities in 1939? Harry was born at Stonaford in North Hill parish. His father was William Ernest Wakem and his mother was Jane Wakem, nee Buckingham, from whence Harry got his middle name. William worked as a labourer on the Trebartha Estate. In 1911 the family lived in Trebartha Mill. Harry had an elder sister, Olive, and an elder brother, William. He also had a younger brother, Charlie and a younger sister, Nora. For a short while when Harry was a baby the family lived in the Pill area of Saltash where his father operated the mill, but he would have regarded North Hill as his home. It was where he was baptised and where he grew up. 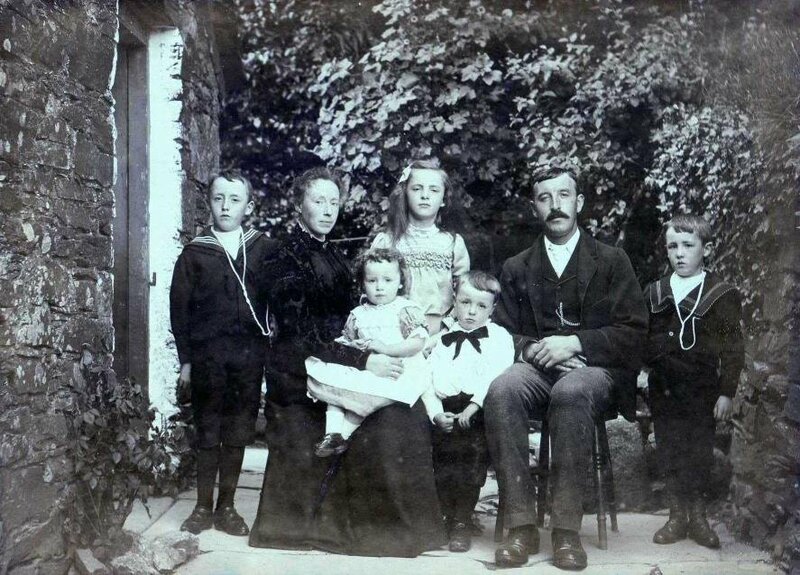 The family are shown here at home in North Hill and Harry is on the right, somewhat prophetically in a sailor's uniform. As a teenager through the years of World War One Harry worked as a market gardener but on his 18th birthday he enlisted into the Royal Navy at Devonport for a 12 year period of service, all of which was spent as a stoker. He was just 5 feet 7 inches tall with light brown hair, brown eyes and the fresh complexion of his youth when he was first posted to HMS Vivid II which was a shore establishment for the training of stokers. 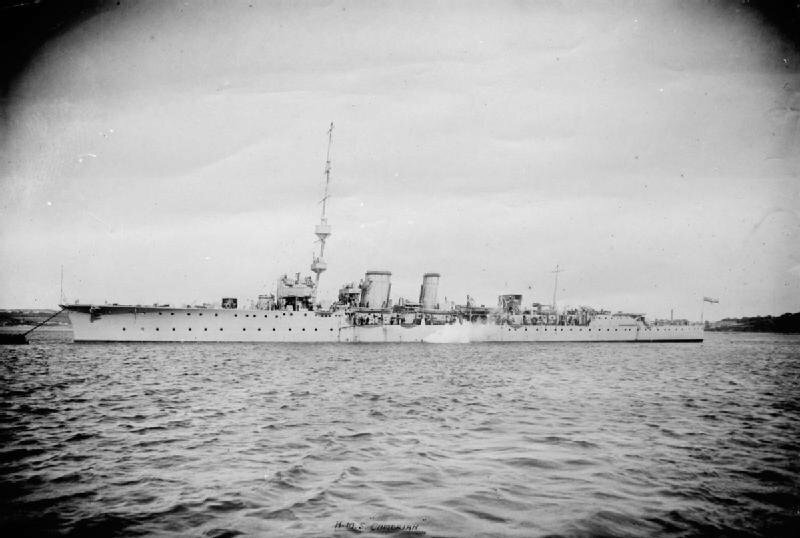 Harry's first sea going posting was in May 1920 when he joined the C-Class light cruiser HMS Cambrian which can be seen below at anchor. Wikipedia records HMS Cambrian's activities as follows: The ship was assigned to the North American and West Indies Station the following month, where she served until 1922. Cambrian's crew spent several days in August trying to tow off the schooner Bella Scott after she had run aground near Kingston, Jamaica and received a brief refit in Bermuda in March/April 1920. The Prince of Wales again visited the ship on 26 September in Dominica. On 25 January 1921, she was inspected by Vice-Admiral Sir William Pakenham at Bermuda and again on 17 June. The ship arrived at Plymouth, Massachusetts to participate in the Pilgrim Tercentenary celebrations on 31 July. 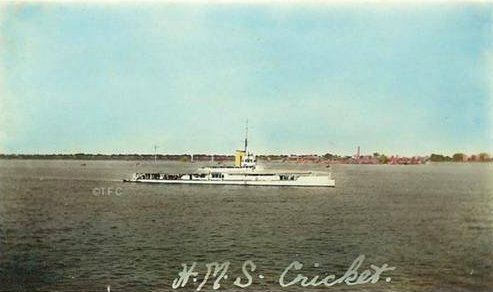 After a short spell back on shore at HMS Vivid II he was posted to the insect class gunboats HMS Cricket, Mantis and Bee from 1923 to 1926. In this period the gunboats were on the Royal Navy's Yangtze River Patrol in China. Harry's final posting was to on HMS Erebus, a gunner training vessel, before his 'paper' transfer to HMS Carysfort, which was the flagship of Devonport at the time and through which demobilization occurred. 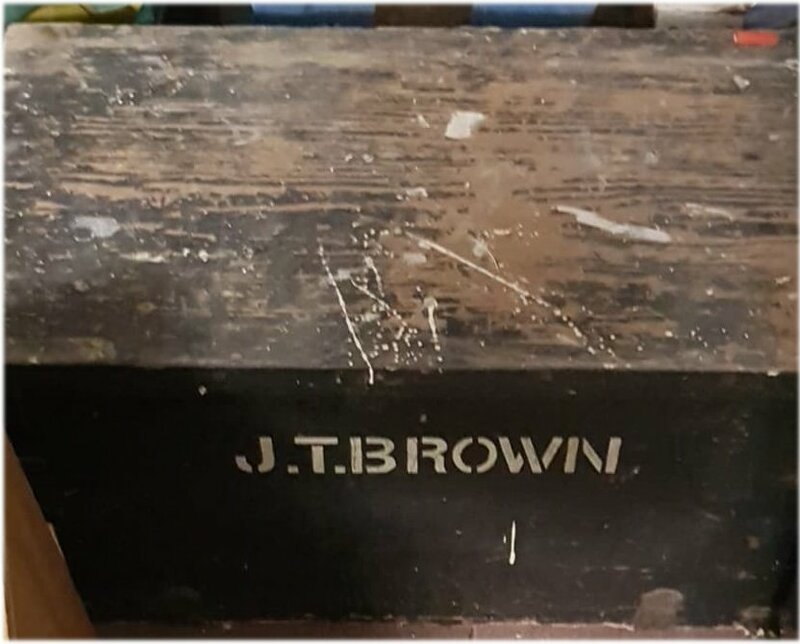 On the 28th September 1891 John Thomas Brown joined the Duke of Cornwall's Light Infantry at Bodmin - age 20 years 10 months; a carpenter; service number C/3495; single; 5' 7"; 127 lbs; fresh complexion; dark brown hair; scars on right thumb and left wrist; father was John Brown of Polyphant, near Launceston, Cornwall. By the end of the year he had already been posted to Dublin where he earned education certificates, a good conduct award and underwent a 59 day spell in hospital in Dublin suffering from an infection. He was posted to Newry after leaving hospital and whilst there extended his service period to 12 years with the colours. 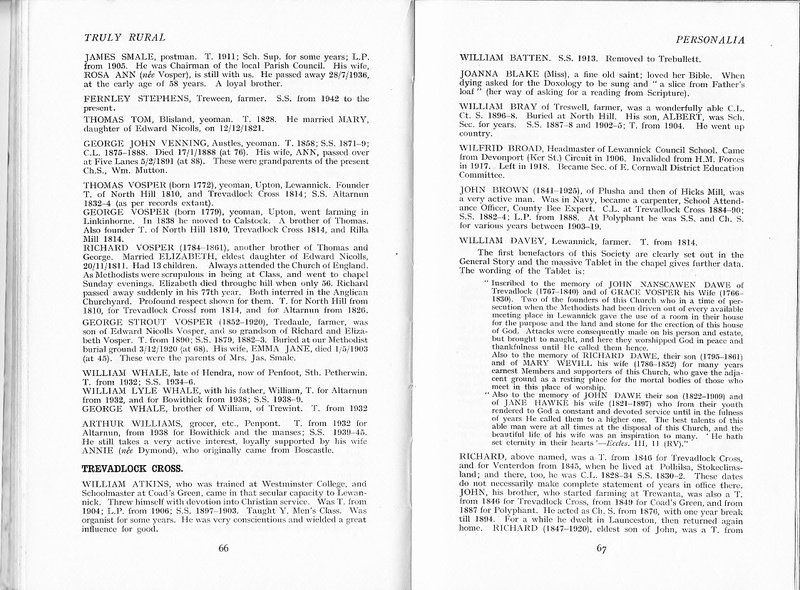 After a brief spell at Chatham where he qualified for the position of Pioneer Sergeant he returned to Ireland and was promoted to lance corporal. 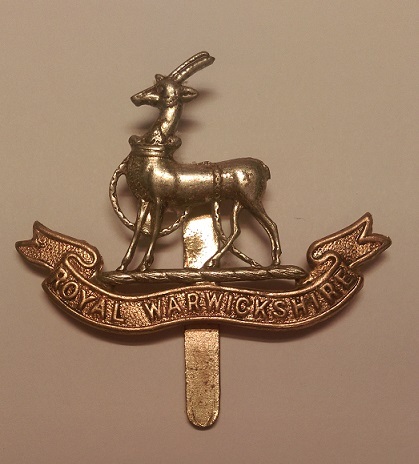 On the 1st of April 1898 he was transferred to the 3rd Battalion of the Royal Warwickshire Regiment, given the regimental number of 5887 and soon afterwards was promoted to substantive Pioneer Sergeant. Pioneer Sergeants have existed since the 1700s. The tradition began when every British infantry company had one 'pioneer' who would march in front of the regiment. He would wear a 'stout' apron, which protected his uniform whilst he was performing his duties, and carry an axe to clear the path for anyone following behind. It was also the Pioneer Sergeant's duty to kill horses that had been wounded in battle. He would often have to cut off one of the stricken horse's legs so that its rider could receive a new animal - each had a number branded onto its hoof to prevent false claims, such as if a cavalryman had sold his mount. Pioneers in those times would also carry a sawback sword, pickaxe, billhooks, shovels, and axes. They were traditionally the largest, strongest and most imposing members of the company. The pioneer sergeant also acted as the blacksmith for the unit. As a result, he was allowed a beard to protect his face from the heat of the forge. From July 1898	to 1902	he was stationed in Malta, where he further extended his service to 21 years, before being sent to Bermuda for over a year. John spent some time in Gibraltar and in South Africa with the 1st and 2nd Batallions, before returning to the UK in 1907. Having been medically examined for service in India, he was found fit if he were to be provided with dentures. John wrote to the Army saying he wished to supply his own dentures and was re-examined for service in India and having been fitted with the required dentures was sent to India, arriving in October 1907. Originally posted to Quetta, John took part in the North West Frontier Campaign and in operations in the Zakka Khel country. 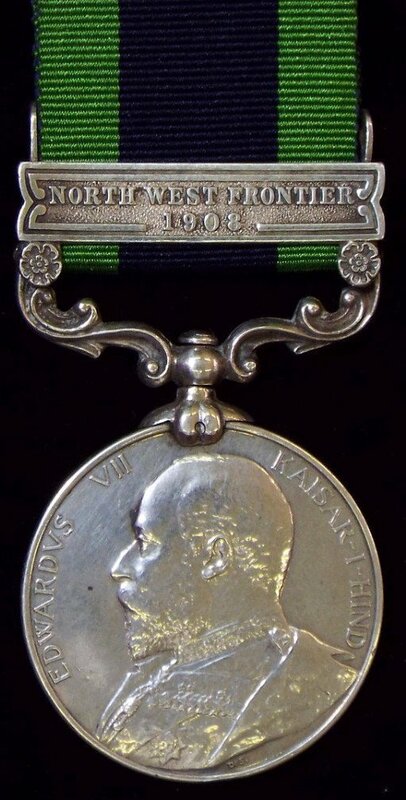 He was awarded the India General Service Medal with clasp for the North West Frontier (pictured here). Further postings saw John in Peshawar, Cherat where he was treated for malaria and Bombay (now Mumbai) before returning to the UK in January 1913. 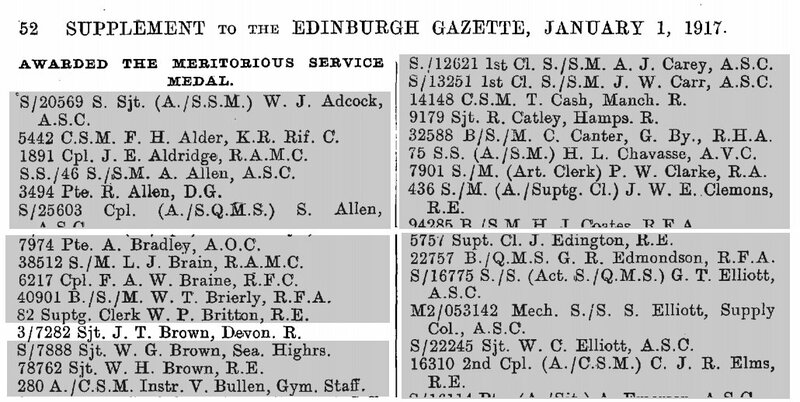 On the 18th January 1913	John was discharged from the army upon termination of his period of engagement. He had served 21 years 105 days. Before summer had arrived he had married his widowed cousin Jane and settled down to domestic life in Lewannick. He hadn't reckoned, though, that his peace would be interrupted by the invasion of Belgium by Germany. Britain declared war on Germany on the fourth of August 1914 for this aggressive act and started to gather together its army to send to fight Germany on the battlefields of Europe. 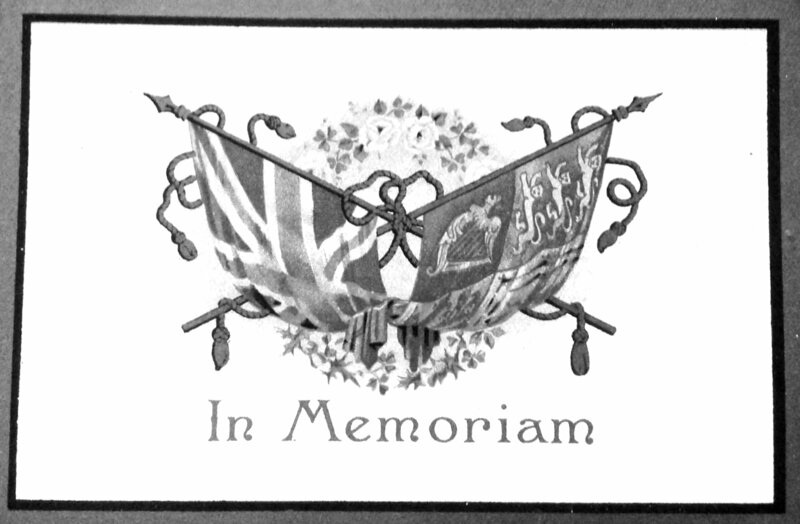 John was an experienced soldier of some standing and on the 7th September he was having an army medical examination in Exeter which he passed. He enlisted for the Devon Regiment and was given the service number of 3/7282. 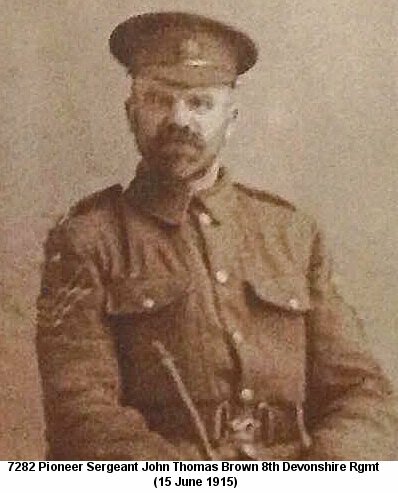 Having served almost a year, presumably training new recruits, on the 7th April 1915 he was re-examined and found fit for active service. He was sent to France with his service starting there on the 25th July. By the end of October 1916 he was at Pont Nieppe in France where he was ordered to hospital after reporting an unusual heart beat in his chest. Extract from the war diary of the regiment showing their position at Pont Nieppe and the 3 officers and 28 other ranks rated as sick. John was one of these men. A later medical board recorded has condition as follows: "Did not enjoy his food. Two mornings after he could hear musical sounds distinctly in his chest with violent throbbings. Could not account for the condition beyond very hard work. In fairly good condition muscularly but unfitted for further military service on account of his heart disease. Distinct diastolic murmur of aortic valves, propagated down to sternum. Heart slightly enlarged on the left. There is no organic disease of the heart. Compensation is adequate for a sedentary life. The result of active service". 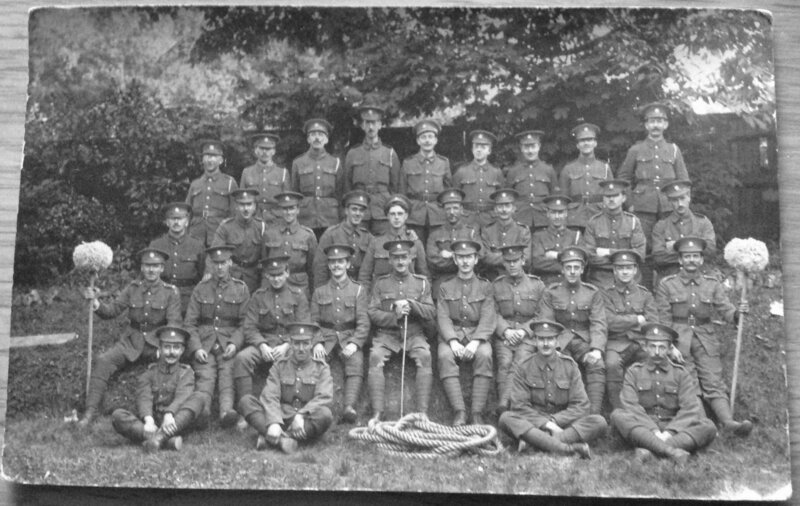 The rope and the two pom-poms on sticks may signify that this group of men, probably a company, had benn the vistors in an inter-company army sports events featuring tug-of-war and piggy back jousting. He was quickly transferred to hospital at Balleiul and then to Boulogne to be sent back to the UK. A few days passed before he arrived at Marlborough Rest Camp where he was assessed by a medical board that decided he should be sent to Queen Mary's Military Hospital at Whalley in Lancashire. He was admitted there but his time in hospital was limited. At the time there was little that doctors could do to improve his condition and so he was discharged after 28 days and sent home for Christmas to Cornwall and a period of rest. In December John attended a medical board in Exeter that confirmed the diagnosis of heart disease. John was now described as aged 47 yrs 1 month; height 5' 7"; dark complexion; grey eyes; brown hair; a woodman keeper by occupation; residence was Hicks Mill, Hillside Cottage, Lewannick, Launceston, Cornwall; military character was "very good"; described as "sober, honest and trustworthy; he has done his duties well as a sergeant at home and on active service". Most importantly, though, his condition was ascribed to being the result of his active service which entitled him to a disability pension. The board recorded that his service completed was 2 years 120 days which included time spent at Armentieres (Pont Nieppe), Bethune, Abbeville and the Somme. They viewed his enlarged heart as to nearly equal the loss of a limb; the condition would not improve; that he was totally incapacitated from work for six months after which time he was to be re-examined. 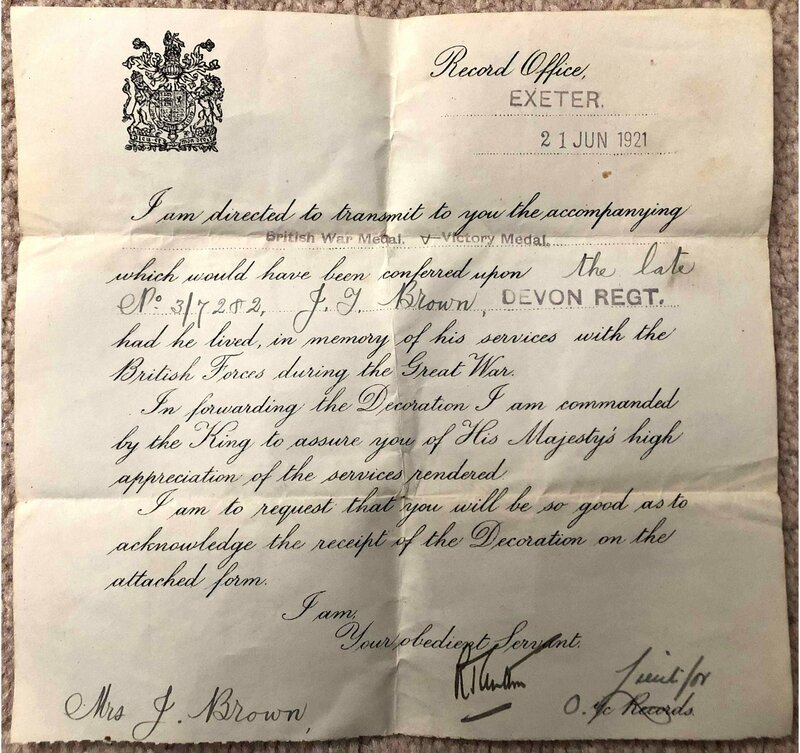 On the 3rd of January 1917	The Western Times reported under a section on "Military Honours for Devonshire Officers" - "Meritorious Service Medal - 3/7282 Sergt J. T. Brown, Devon. Regiment". 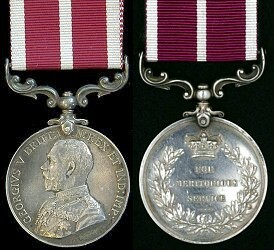 The number of MSMs awarded is limited, no more than eighty nine a year may be awarded in the Army. It may be the case today that in practice these numbers are not reached but that may not have been the position during World War I. 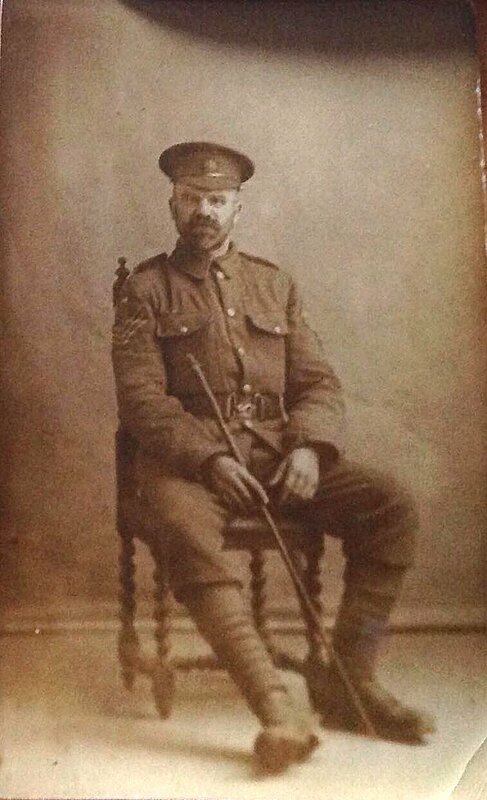 On the 4th January 1917 3/7282 Sargeant Brown, J.T., MSM was discharged from the army and his record was stamped "Unfit for service; TOTAL DISABLEMENT". His pension included an allowance for his step-daughter Beatrice, whom he knew as Beattie. Every six months or so he had a medical board that assessed his condition and, therefore, his pension entitlement. 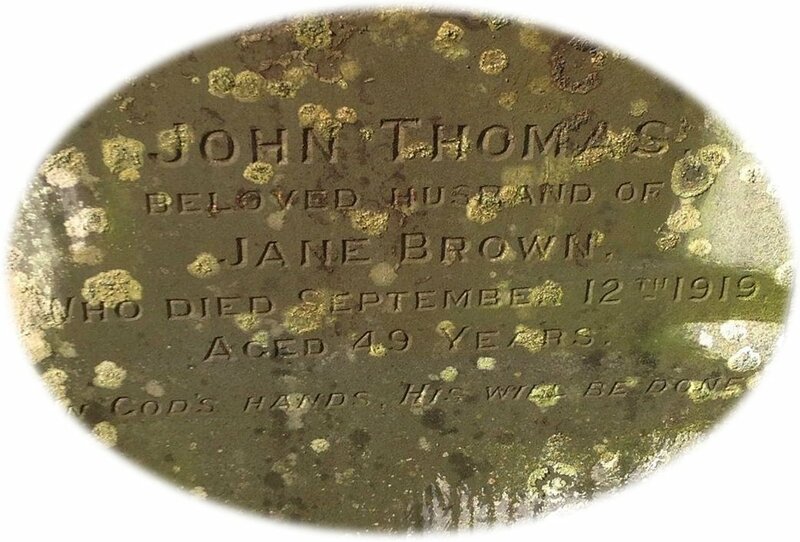 John died from his heart disease on the 19th September 1919 and was buried in the churchyard of St Cyr and St Julitta in Newton St Cyres in Devon, where he was living at the time. 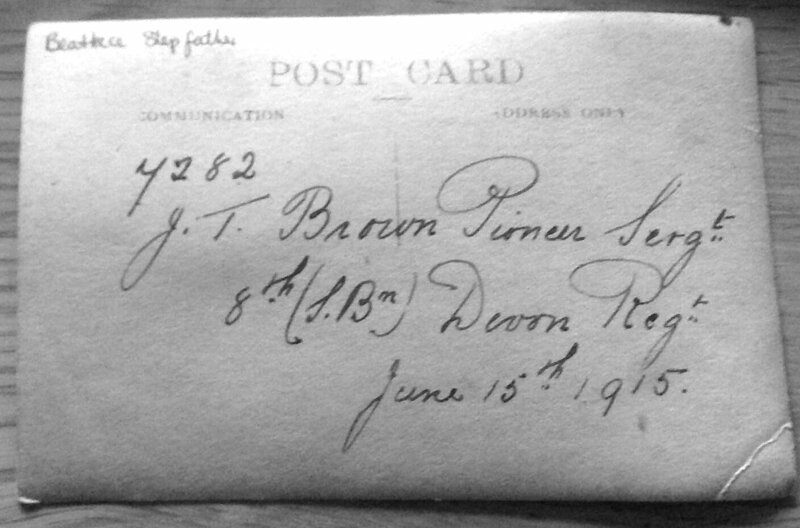 "In loving memory of dear cousin J T Brown from Ellen"
"In loving memory of Dad from Beattie"
"In loving memory of John Thomas Brown, 8th Devon. 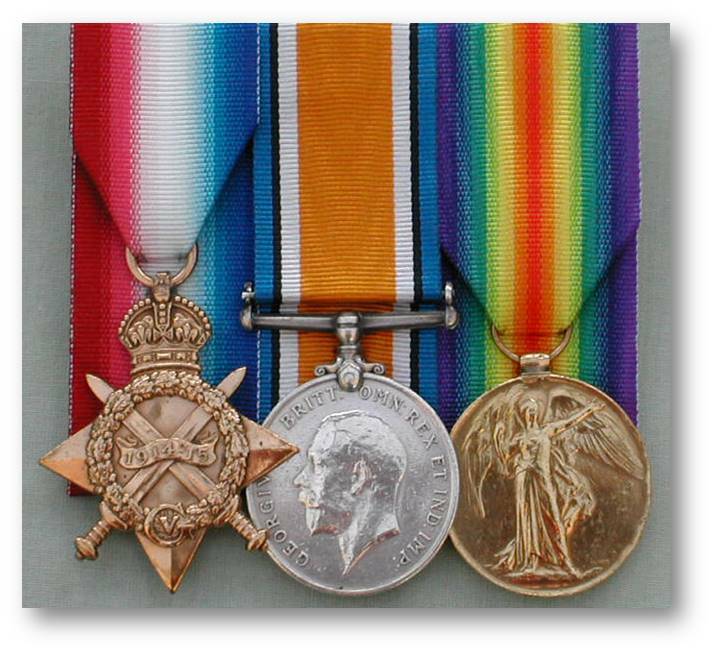 Regiment, from his loving wife, Jane Brown"
On the 25th June 1920	The Army Medal Roll was completed for John and he was awarded the Victory Medal and the British War Medal along with the 1914/15 Star for his service in France from 25 Jul 1915. These were known as Pip, Squeak and Wilfred.